I'm loosely pulling together a small home office 2ch system, and looking for a small sub to complement RT25i's probably running with an HK 3490. Because this area is space constrained, I'm interested in small subs, 8" or so, preferably sealed. I like the driver + passive radiator designs, but my experience with subs is limited. If there are any even smaller than 8's that may fit the purpose, I'd be interested to hear about those as well. What do you guys like for small subs for small spaces? Room is about 10ft square. I do not intend for this to be a serious setup for critical listening, just something to fill in the bottom end a bit, so, trying to keep the budget reasonable - read: cheap without being sloppy. At this stage just trying to get a feel for options. Price range? Size? New? Used? Plenty of ported ones show up on craigslist. You can always plug the port and see how it does. I have never heard or tried these, but http://www.jamo.com/speakers/subwoofer/?sku=SUB800 is a 6.5" with two passives for $360. 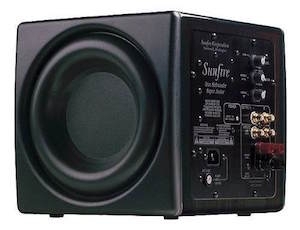 There are some older 8" SUB200 that are ported but do ok sealed. Sunfire also makes some 8" for around $300. Used preferred, $400 or less. What's a good low frequency spec to look for in musical subs, anyway? Heard good things about psw111 or dsw 440 if you want real cheap and polk. But I'm going to recommend an svs of course. Checking out some SVS in the outlet. I didn't realize how small the SB-1000 is - about 14/13/15. Thanks, kind of wasn't even considering anything that serious at first. Deft tech supercubes3's or 2's. Sealed, high power amps and small footspace. They have two passive radiators and one woofer. Made very solid. I picked up a supercube3 at a resale shop and I could not believe how small but heavy it was. And for its size produced a lot of bass. Parasound Halo A51 Amp, Marantz AV 8003 Pre, Arcam FMJ CD36 cd player, Marantz 7007 BD/SACD player,Acoustic Zen Matrix IC's, Analysis Plus Crystal Copper Oval IC's, Acoustic Zen Satori speaker cables, B&W 703's Fronts, Center Martin Logan Motif hybrid, Surrounds DefTech BPX, 2 X DefTech Supercube Reference Subs, DSpeaker Antimode 8033 EQ. Scott, check out the SVS Outlet. Awesome subs. Those little sealed REL 8" subs are intriguing , would be interesting to see a small 8" sub shootout for music someday. !#$%, guys. I did not want to get sucked into this. Why I thought I could get in and out of this quickly with something simple and cheap I have no idea. Both the SB1000 and the Deftech SC2000 look good. Perfect size, nice specs, better than (I think) I need for this project. On one hand, more versatile in the long run. On the other, I originally only wanted to be in for a fraction of what these are going for. Looks like higher end Deftechs are available refurbished at similar cost. pk - thanks for the info on those you mentioned. Jamo looks nice, but only 42Hz? Be creful with specs, they are not always accurate. Deftech does overstate their bottom frequency. They start -3db rolloff several hertz before their bottom line frequency. But they still hit low are relatively fast and made well and can be had used for a decent price. Good luck with your search!! Are you ok with DIY? I found a VERY SMALL sub using a 5 1/4" driver that did a GREAT JOB nearfield and is VERY VERY SMALL and cheap. Here is a build of it. 2 of those placed ON THE DESK, or near your feet, and I think you would be MORE than happy. With a small room office rig like that and with using the RT25i's, I seriously think you'd be more than impressed with the Polk PSW111. That little sub has more than impressed me in several small-room applications. Definitely, one of the cheaper routes to go here. I also liked the Rel T5 (8"), the Martin Logan Dynamo 700W (tiny 10") and a couple of the various DT SuperCubes. The SuperCubes lost out on quality of design and structural soundness. The ML beat the Rel on sound quality, price, build quality and versatility (down-, or front-firing). The ML felt like it was put together better (a more solid feel to it), could fill a larger room much better, if need be, and the high-gloss finish of the Rel seemed to get finger prints, smudges and dust on it if I was just standing next to it. JMHO. Ahem, I think there's a Polk PSW111 for sale in the flea market. One thing msg made note of is he's only needing to fill a small area for 2 channel music listening, plus something that won't cost a lot, $400 or less . Please correct me if I'm wrong. Eventually, I'll be adding a small sub to my computer rig to fill in the LSi9's. Hopefully the guys here can locate something nice for you msg. Have to say my dsw 500 I had was a really nice sub. I highly recommend them. 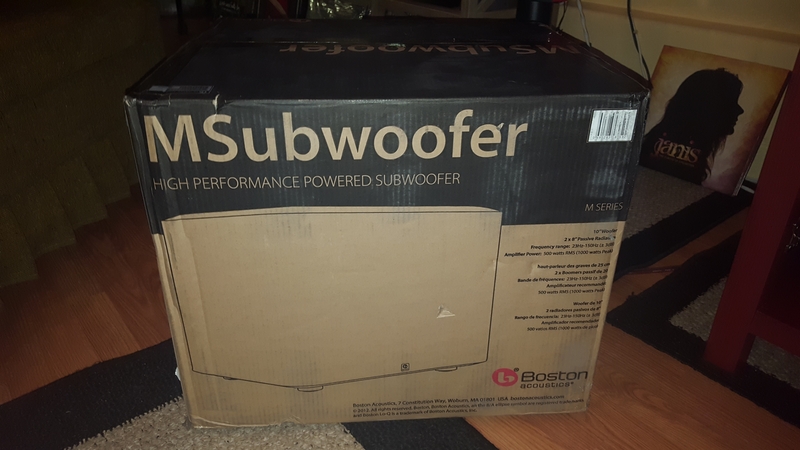 I only used it for home theater, still a great sub though. Hey guys, thanks for all the fantastic input on this thread for my little project! So many great recommendations. Rick is totally hooking me up on this Sunfire SDS-8 he picked up a while back, at near Karma, considering what they're going for now. I was intrigued at the time he reviewed it here, and am excited to get it in house. Gained a bit of knowledge into some great sub offerings out there with all your contributions, and I will use this knowledge moving forward next time I need a sub. 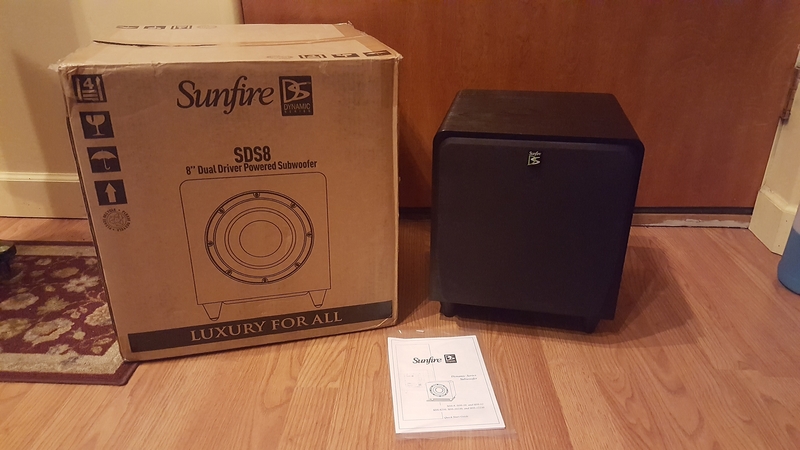 I think this Sunfire SDS-8 will be just the right fit, all around, for the project - size, cost, performance type all seem inline with what I'm looking for. Not sure how much I can say for the current owner, but gotta make compromises, somewhere I guess [jab jab ]. Extra points for keeping my conscience relatively pacified. This time, at least. 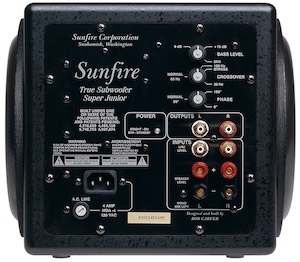 For future use to those looking for small subs, another consideration for the list is the Sunfire True Sub Super Junior - TS-SJ8. 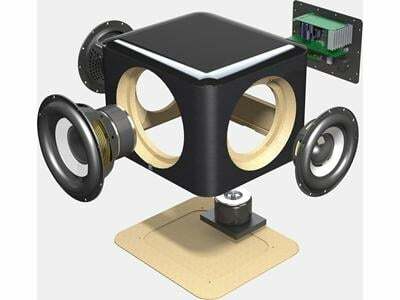 It's the smallest I came across, measuring 9" cubed, with 8" driver/opposing passive radiator design. They seem to be available for around $300+ or so, the better condition ones costing more, however may be prone to similar plate amp issues as was the larger True Sub MKII. Would love to get my ears on those sunfire subs. A great recommendation, I didn't even think of it. Heard great things about the super junior and true subs. I just received the SDS-8 pictured above from Rick. Thing looks brand new! Obvious that it was packed with care and attention to factory packaging detail so that I could have the "new sub" feeling for myself. Absolute top notch transaction. Great communication, responsive to questions, honest and forthcoming with info and perspective, and just all around cool to chat with in general. Rick, truly a pleasure working on this. Thanks for the great opportunity. Really looking forward to getting the space set up and checking this thing out, but got friggin' grown-up chores and responsibilities calling for now, arrrgh! Glad to hear that it arrived unharmed. I hope that you like it as much as I did. I was pleased with its performance with both music (always my priority) and movies. It absolutely rocked my loft with some pretty tight and musical bass. Since the room you'll be using it in is similarly sized, I think it will work out well for you too. Kinda rare these days for a sub to have a class A/B amp and a big 'ol toroidal transformer. I am banking on its 500 watt rms amp, a 10" woofer and two 8" passive radiators, to work well in my living room setup. Now, this just seems to be a recurring theme around here, doesn't it?! Well done, Rick! I hope to one day find something I need that you're trying to move along. Looking forward to a review of the MSub Rick. Revisiting this thread for a review of small, musical subs. Anyone know how to get in touch with @Rick88 ?